Michigan Medicine, a premier academic medical center, is made up of the University of Michigan’s hospitals and clinics, medical school, affiliated group practice, biomedical research community, and health corporation. 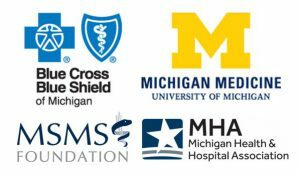 Blue Cross, Blue Shield of Michigan, the largest health insurer in Michigan, serves 4.5 million Michiganders with more than 152 hospitals and 33,000 doctors in its network. Michigan Health & Hospital Association (MHA), a non-profit association, represents community hospitals and health systems and supports their work to provide quality, cost-effective, accessible care. MSMS Foundation, a non-profit charitable organization, is sponsored by the Michigan State Medical Society to advance the field of health for the public good. Interested in supporting this program and about the benefits of sponsorship? Contact Sandra Bitonti Stewart at (734) 998-6043 or sbitonti@umich.edu for more information.